Worried about moving your piano to a new home? Here’s why hiring a professional piano mover is ALWAYS the right choice. Whether your residential move is just across town or to another state, moving a piano is no easy feat. Piano moving is a daunting job that requires planning, preparation and a great deal of effort, especially because they are very heavy, bulky and fragile. At Precision Movers, we offer a wide range of commercial and residential moving services to help streamline your moving process. Our professional piano movers will take the utmost care when transporting your instrument, eliminating many of the challenges you might face otherwise. For most pieces of furniture, a few friends or family members can be all the help you need to get the job done. Of course, your piano is not most furniture. It is heavy and expensive and moving it can be an extremely challenging task. Depending on the style of piano you have, you could easily be moving over a thousand pounds. This is an incredible amount of weight and, without the proper equipment to secure your back and protect your other body parts, you could seriously injure yourself. 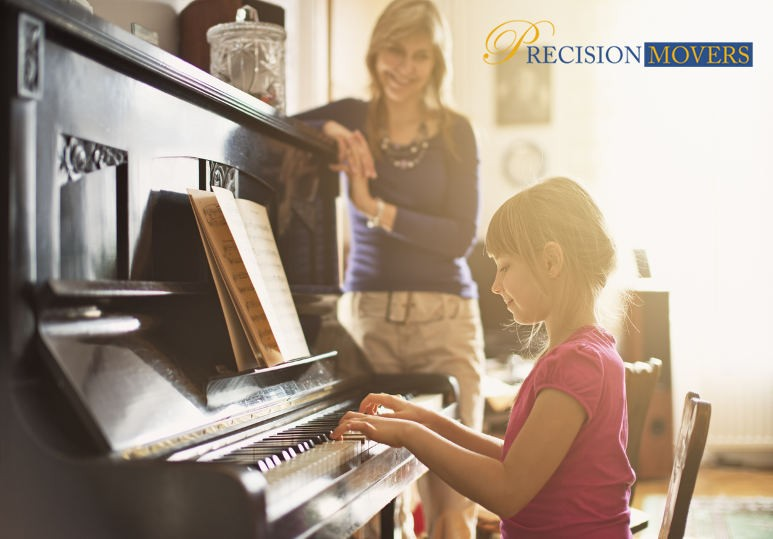 So while you may think that you are saving money by moving the piano yourself, the price of getting checked by a doctor following an injury, as well as any follow-up procedures, may far exceed the cost of using movers in the first place. Any damage could easily affect the sound of the piano, which can lead to costly repairs. Professional movers understand these issues and they know how to move the instrument without causing any damage to the piano’s mechanics. Pianos are generally bulky and odd-shaped, which can make them extremely difficult to move through doorways and up/down stairwells. If you are not careful, you may end up scratching the paint on the walls, damaging doors or creating holes in your walls. It is best to hire a professional residential moving service because they have the skills, tools and know-how to prevent such accidents and save you unnecessary moving expenses. You may think you are saving yourself time and money if you move a piano yourself but, with their experience and specialized equipment, professional piano movers can complete the job in just a fraction of the time it would take you to do it. Moving an instrument requires special boards and dollies and professional movers know how to quickly take the instrument apart, transport and reassemble it, which you may find time-consuming and difficult. While you won’t be able to eliminate every moving hazard, by educating yourself on how a piano should be transported, you are less likely to experience problems. However, at the end of the day, you’ll have to trust your mover, which is why it’s crucial to find a reliable moving company. To find out about the costs of our residential moving services, contact our Calgary office today at 403-540-4393 or fill in our online contact form.